Awaiting vs. Waiting – What’s the Difference? Home » Awaiting vs. Waiting – What’s the Difference? When two words have largely the same meaning, it can be difficult to choose between them. Waiting and awaiting are both perfectly fine words with similar meanings, so which should you use? In part, it depends on the structure of your sentence. As we will see, waiting and awaiting are not always interchangeable, depending on how you use them in context. What is the Difference Between Awaiting and Waiting? 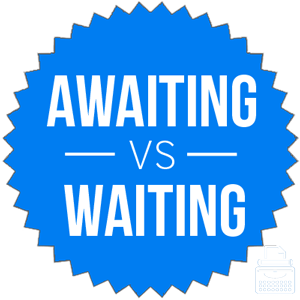 In this post, I will compare awaiting vs. waiting. I will use each word in an example sentence, so you can see how it looks in context. Then, I will show you a helpful memory tool that will make choosing either awaiting or waiting easier in your own writing. What does waiting mean? Waiting is the present participle conjugation of the verb wait. The word wait has multiple meanings, including a hidden place, as in the phrase lie in wait. Here, though, I will focus on its meaning as a verb that means to delay in expectation of something happening. A person might wait for a bus, for instance, or a puppy might wait for its owner to come home from the store with doggy biscuits. “I will wait here while you find a way to convince me that you are still interested in making our relationship work,” Tanya said to Cletus. “Time waits for no man,” goes the old proverb. What does await mean? Await is another verb that means to delay in expectation of something happening. Awaiting is its present participle. While await and wait are similar in terms of meaning, they differ in usage. Wait can be used without an object, like in the sentence I am waiting. Await, meanwhile, requires an object. The sentence I am awaiting is improperly constructed; you must be awaiting something. I am awaiting your response would be a more appropriate construction. I await the exciting conclusion of the HBO series Game of Thrones in 2019. “I await your payment,” said the bounty hunter as she dropped the head of her target at her client’s feet. Both wait and await are very old words. Await is slightly older and first appeared in English in the 13th century. Wait came to prominence about 100 years later. Waiting can be used on its own or with an object. Awaiting is a transitive verb that requires an object. If you want to keep your sentence simple and omit an object, you must use wait. Otherwise, you could use either wait or await with an object. Wait is a bit cleaner and more contemporary, while await could be useful if you need a more formal tone, like in wedding invitations. Await has additional letters, and requires additional words to make sentences work. These extra letters and words are your clue that await needs to be used with an object to be grammatical. Is it waiting or awaiting? Waiting and awaiting are verbs that mean to delay in expectation of something happening. Awaiting is a transitive verb and requires an object. Waiting is an intransitive verb that can be used with or without one. 1 What is the Difference Between Awaiting and Waiting? With Regard To or With Regards To – Which is the Correct Spelling? Competence vs. Competency – What’s the Difference?